Sweden 1999, Luxemburg 1961, Ireland 1970 and Denmark 2000 are in Heat 4 of Ultimate Juke Box Jury. With Ben Morris and Donald McNaughton on the judicial bench, and hosted by Ewan Spence. Sweden 1984, France 1977, Ireland 1993 and Greece 2005 take part in the third heat of Ultimate Juke Box Jury. With judges David Elder and Andrew Main, hosted by Ewan Spence. Join Ewan Spence and guest judges Ben Morris and Ross Tillbrook as ESC Insight continues to ask the question “which is the greatest winning Eurovision song of all time?” It’s heat two of Ultimate Juke Box Jury. 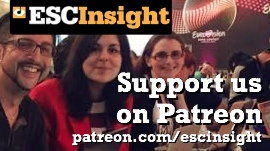 Join Ewan Spence and guest judges Paul Jordan and Colin McKnight as ESC Insight attempts to answer the question "which is the greatest Eurovision song of all time?" It's the first of many heats in Ultimate Juke Box Jury!